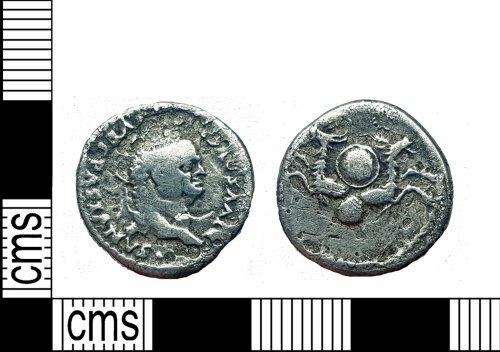 Silver Denarius, Titus (Divus Vespasianus commemorative issue), Rome, 80-81 AD, RIC II (2nd ed.) Titus No. 357. O: DIVVS AVGVSTVS VESPASIANVS. Laureate head right. R: Two capricorns springing from shield inscribed [S C]. Obverse inscription: DIVVS AVGVSTVS VESPASIANVS. Reverse description: Two capricorns springing from shield inscribed [S C].